We are excited to join the Virtual Book Club this year! This month, we are joining in on the leaves theme with the book being Leaf Man by Lois Ehlert. Be sure to check out the great list of leaf art projects and kids activities to go along with this Fall-themed book at the end of post. *This post contains affiliate links. Please read our full disclosure policy here. Fall is our favorite season of the year. We love the crisp wind in the mornings and evenings. We love the smell of spices, pumpkin and the anticipation of special holidays for our family. We always celebrate the beginning of Fall by making crafts and other fun activities. 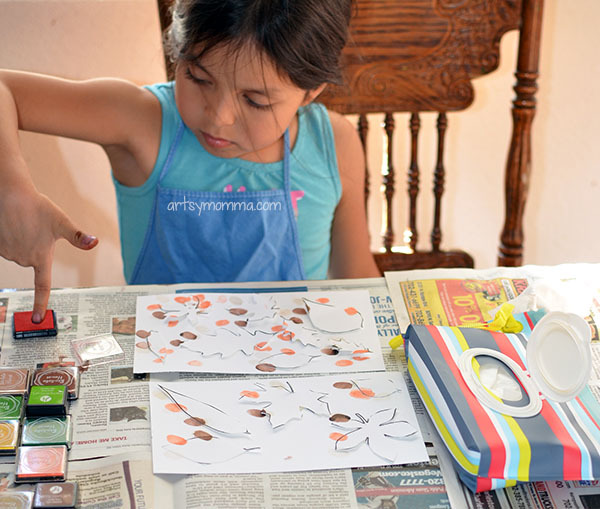 Here, you will see a beautiful Autumn leaf painting activity that will go perfect with celebrating Fall! It incorporates fingerprints to make leaf silhouette art. Slightly older kids (my daughter is 5) could use this as a lesson on negative space. For this project, we will be using Leaf Man by Lois Ehlert for inspiration. It is a fun story about a leaf man that goes wherever the wind takes him. He gets to travel to different places in the countryside and gets to have many fun experiences. Leaf Man is made of real leaves. The illustrations are lovely and they are great to spark children’s imagination. Leaf arts and crafts for kids are so much fun during Fall. Why not include learning about the different shapes of leaves and the colors of Fall to make this project more creative and amazing?! Take a look at how to make it. If using a printable template, cut the leaves out. You could instead use real leaves. Place the leaf cutouts on your cardstock in random place. Use a small piece of rolled masking tape to temporarily hold it in place. Talk about the different shapes of leaves and name any you can identify such as a Maple leaf. Also talk about how the colors change during this season and what colors they change too. Pick ink pads or paint in these colors. Make fingerprints all over using the different colors of ink. Where the leaf templates are stuck on, make sure to cover all along the edges of each leaf with the different colors. Be careful not to get any under the templates. INstead, you want the prints to go partially along the edge of the leaf template and partially on the main page. It isn’t necessary to cover the entire page with fingerprints, but you do have to make sure that there aren’t any white spaces along the leaf edges. Then, you are ready to pull off the leaf templates and see them magically appear. Speaking of magic, I caught my daughter using her pumpkin wand saying a chant. She is forever saying things she thinks Shimmer & Shine would say. She did this for literally every leaf she pulled off waving her magic pumpkin wand – too cute! 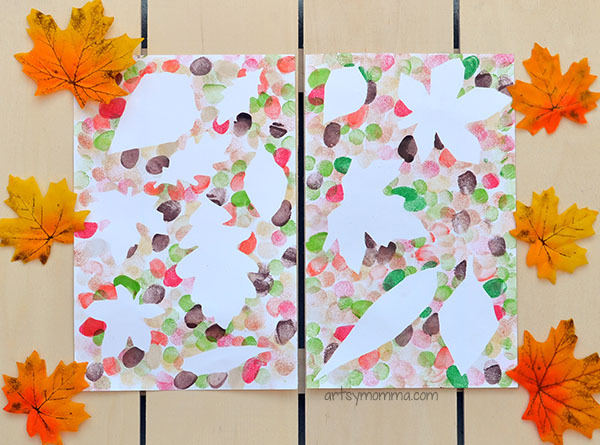 Isn’t this a Autumn leaf painting a great project to include with your Fall leaf art? They will make awesome kid-made decorations! 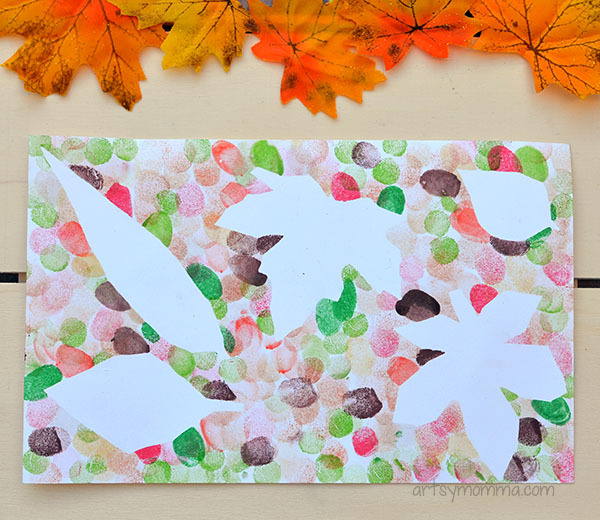 For 2 more fall art projects for kids like this, head over to our other blog and print this Fingerprint Fall Tree Math Game or make this fun Handprint Leaf Craft. The colours on this are just beautiful. Such a lovely autumn craft.